Shortly after we crossed a bridge, the scenery became magical. Big, tall redwoods were everywhere with dense ferns on the forest floor and moss growing on the trunks and branches of trees. The thick canopy stopped most of the rain, with the occasional big drop that fell off of the leaves. Water droplets beaded off of my black jacket and hat while they fell off of Loretta’s black umbrella. I expected Ewoks from Star Wars: Return of the Jedi and dinosaurs from Jurassic Park to appear at any time. I felt I was on the set of these movies because it was the set for forest moon of Endor in Return of the Jedi and Lost World: Jurassic Park. There were fallen trees across the forest floor, and some that leaned against other trees, forming a tee-pee. Thick ferns covered the forest floor with its bright green leaves. I imagined myself riding a new cycle like in the Star Wars movie, dodging trees and fallen trunks, one hand on the handle and the other hand shooting at Storm Troopers while winking at the Ewoks lurking in the trees. The trail crossed the road and became the Foothills Trail that led to a marked tree called The Big Tree. It’s not the biggest or the tallest in the national park, but just a big, tall, tree. Nearby, I saw a bright yellow thing on the ground that turned out to be an upside down banana slug. I gently turned him over and he crawled away slowly. I thought I saw something special until they just popped up in many spots further down the trail. The rain largely stopped and the hike was going so well we decided to go on the longer Cathedral Trees trail. While the Foothills Trail more of a walk than a hike, the Cathedral Trees trail a hike because it was hilly, uneven and full of roots that were slippery in the mist and the rain. We jumped around puddles under the canopy of very tall trees with clusters of five trees that formed circle. The classic question of “If a tree fell in the woods and no one heard it, did it fall?” did not apply in this forest. 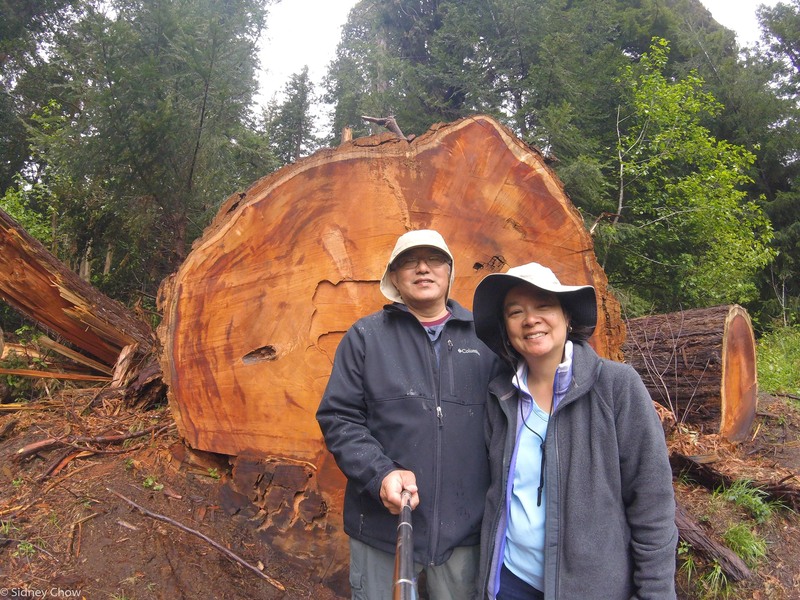 We came upon a redwood that fell a month ago. According to the ranger, not only was it heard all the way at the visitor center a couple of miles away, it was felt because a nearby seismograph registered 2.3 on the Richter scale. It was freshly cut to clear the trail with bright red color and a fresh look, unlike trees that fell long ago. This tree took out three others on its way down and created a dent in the trail two feet deep. The Newton B. Drury Scenic Parkway took us through tall trees with heavy canopy like we were driving through a tree tunnel. Portions of it were so dark the automatic car headlight turned on in the middle of the day. The road was flat to start, which allowed easy biking, before it climbed and descended to the coast. 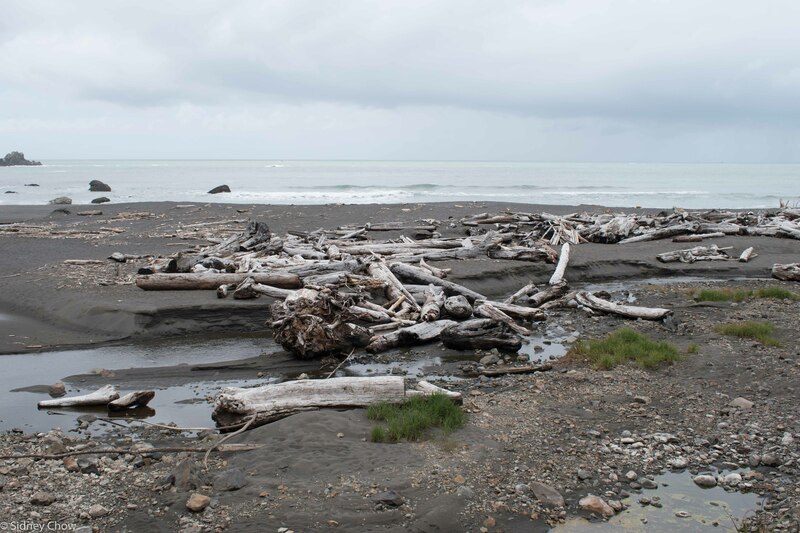 We took the Alder Camp Road that took us to the High Bluff Overlook, past a world war two military radar station disguised as a regular house, to Klamath Beach Road that overlooked some rock outcroppings and a black sand beach with driftwood. At High Bluff Overlook, the coastal scenery was beautiful with low clouds moved rapidly by the wind. I was looking for a place to try time lapsed photography again after the Grand Canyon and this was a great place to experiment with time lapsed photography. I set up my big tripod with my DSLR and the small tripod with my GoPro, both pointed at the same scene so I can compare the result. It was windy and cold and Loretta was once again a patient saint because she agreed to wait the half hour in the car. I set up the shot and retreated to a picnic bench away from the cliff so I can avoid the wind to wait for the cameras to do its thing. A few people walked by but no one bothered the cameras. Loretta came out and was horrified I was not with the camera and there were other people around. I reminded her that I was sitting right there and anyone going near the camera had to come back and pass me, so I will know if they decide to swipe the cameras. I think that make her feel better. The New York City mentality is hard to break, even after more than 30 years away from the city. Near Klamath Beach, seals were frolicking in the ocean, calling each other as they surface and then dive into the water. White seagulls perched on the rock cropping in the distance, looking for food. Loretta pointed to a black thing in the distance that alternately was above and below water. “I see a whale!” she exclaimed. I said. “Get the binoculars.” She got them and I hurried to put the long lens on the camera and got the tripod. Then she said. “Never mind, it’s only a rock.” I was disappointed and slowly put away the gear. There were sightings of whales yesterday, but no such luck for us. Next came the Yukron loop. The parking lot was empty except for a person resting in a national park maintenance vehicle. This was suppose to be an easy 1.2 mile loop through coastal vegetation with some ocean views. The trail was very disappointing because of the poor trail condition. 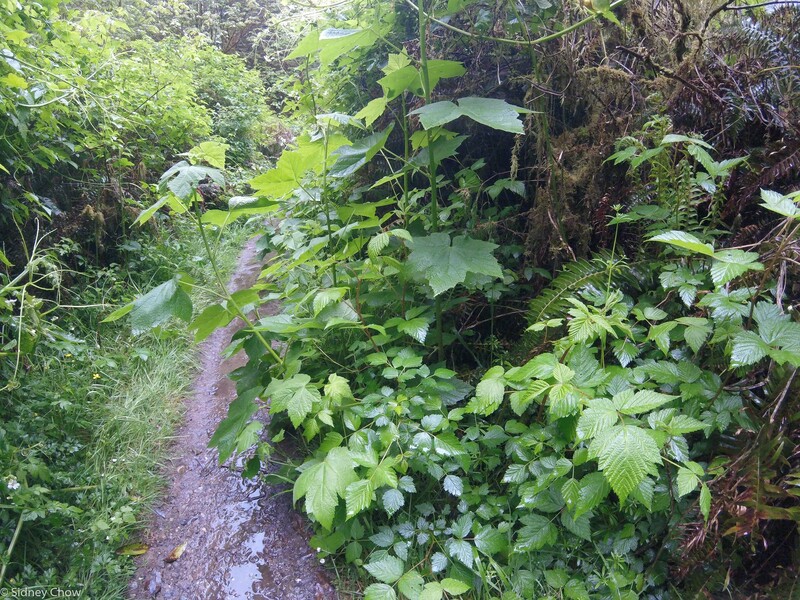 The saw-grass was overgrown and covered parts of the trail to shoulder height. There were prickly bushes that snagged our clothing and pinched through to prick our skin. We had to fight our way through several sections of tall grass on a somewhat hilly trail even though the description said it was flat. All of this would be acceptable if the scenery was beautiful but it was not. There really wasn’t much to look at so I would not recommend this trail. The Crescent Beach Overlook, a short jot down a spur from highway 101, was a nice view of Crescent beach and Crescent harbor in the distance. The view was classic California coast, with cliffs and beach. Next up was Stout Grove Loop, which was six miles of gravel road from the south or a couple of miles of paved road off of highway 199 from the north. We decided to take the scenic gravel route and gave our SUV a nice workout through the potholes. The drive was pretty, going through a forest that curved around some very tall trees, ferns, and creek. The bumpy ride was getting old when we finally arrived at Stout Memorial Grove. The half mile walk started down a paved trail that descended about 100 feet before flatting out to a very nice mulch covered flat path. The giant trees are tall, close together, and imposing. This was an excellent trail, serene and peaceful with heavy shade even on a sunny day. 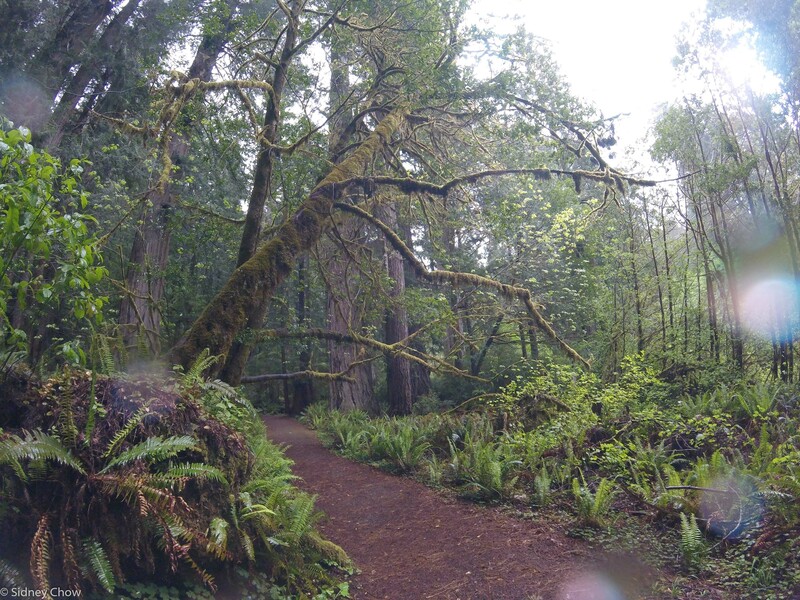 Stout Memorial Grove and Lady Bird Johnson Grove are both excellent trails to get a taste of the redwoods. For us, this was an excellent walk to end the visit to Redwood National and State Park. 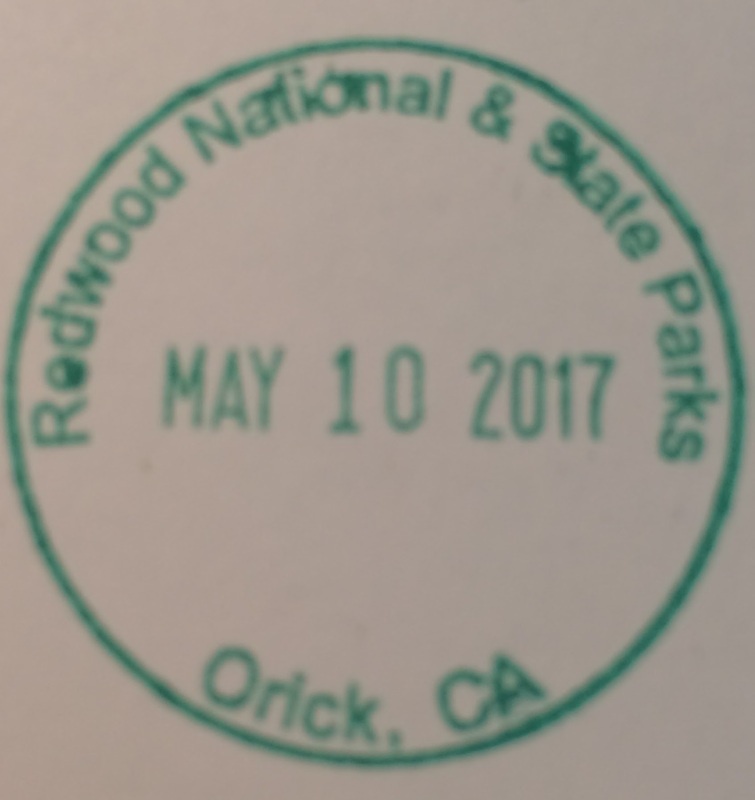 This park is officially named Redwood National and State Parks because the administration of Redwood National Park, Prairie Creek Redwoods State Park, Del Norte Coast Redwoods State Park, and Jedediah Smith Redwoods State Park were combined in 1994. Preservation of redwoods started in the 1910s. In 1860, there were two million acres of old growth redwood forest but it only took 60 years to log 80% of the redwoods. In the 1920s, California established state parks to preserve the redwoods but due to the powerful timber industry lobby, the national park was not established until 1968 by President Johnson. President Carter added a large parcel of land in 1978 to expand the national park to better preserve the ecosystem. Soak up and take advantage of the resources around you to grow and thrive, just like redwoods soak up the mist of coastal California to grow straight and tall. 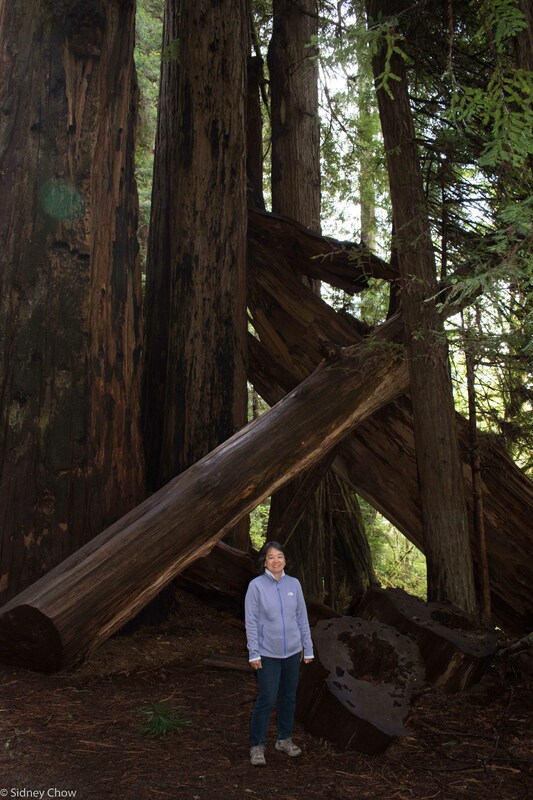 Redwood National and State Parks delivered on the core promise: Tall trees. These trees must be seen to be believed. They soar to dizzying heights matched by no other. There are lots of redwoods in this unique habitat. Redwood National and State Parks is more than tall trees. 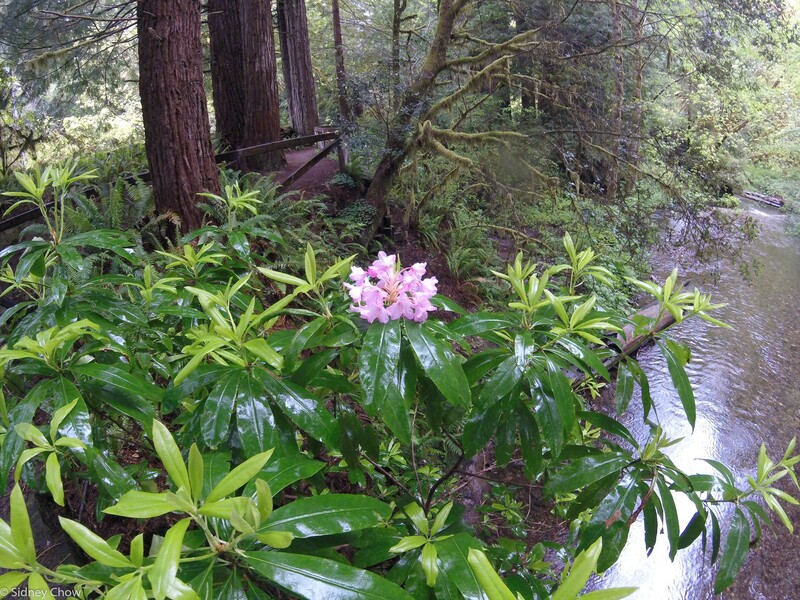 There are many trails to explore, and many spur roads off of Highway 101 to visit. Many trails are short (1 to 3 miles) and mostly flat. The view of the coast is dramatic, with waves crashing on the rocks and a black sand beach. Elks are easily seen with the promise of occasional sighting of whales in the ocean. The park has many places to disperse the crowd, great for biking and family oriented hiking. Plenty of services are in small towns nearby. This was a fun park to visit. Have you visited Redwood? Leave a comment below on your experience. Click on the Follow link and get an email when new postings are available. I will not share your email so no worries. Redwood National and State Parks is narrow but lengthy. It stretches 50 miles from Big Lagoon to Crescent City. Hike, hike, and hike. The trails are mostly easy and the scenery beautiful, but you must get out of the car. All trail heads are easily accessible. There are a few roads that are very curvy and pot holed. A high clearance vehicle is recommended. Allow three days if possible to explore the variety of this park and hike. Entrance Fee: None. It’s free!